Microsoft Jokes for Christmas: Since it's Christmas season already, I'm throwing out plenty of technology related jokes all throughout this month to keep everyone merry, happy, joyful, glad, cheerful, bubbly (and whatever adjective that is related to being merry). To kick things off, I’ll give you the lyrics of some "Microsoft" Christmas parody songs. 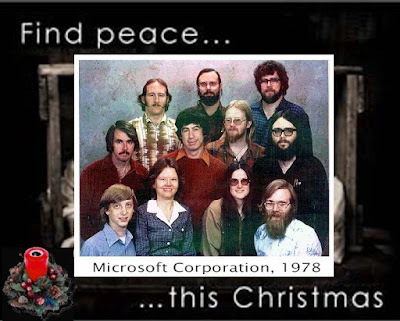 So here are some Microsoft jokes for Christmas, and let's sing them! On the 12th day of Christmas, my true love gave to me: 12 sound cards silent, 11 instructions faulty, 10 modes not supported, 9 apps a crashin', 8 Megs overflowin', 7 files missin', 6 ints conflictin', 5 eighty six, 4 sectors bad, 3 ports not responding, 2 GPFs, and Windows Vista for my PC! What would you feel if ever you'll receive a postcard like this for Christmas? Man that's freaky! Those hippies are scary like hell. I will definitely scream like a girl if ever I get something like that. Pretty scary huh? They may all look like a bunch of hippies then, but they are all filthy rich now. They all look like hippies... except for Bill himself in the lower left. He was ahead of his time, even then, and just looked like a geek.